Jason Stafford is a hired financial investigator who works for the companies he worked for and did business with prior to his arrest and time in prison for fraud. This time he has to deal with a Bernie Madoff type Ponzi scheme. Big bucks. Then it collapsed, William Von Becker was caught and committed suicide – or did he? His family is looking through the wreckage and wants to clear the company name – or so they say. There is money missing. Meanwhile, Stafford has an autistic son and a viscous ex-wife. These are worked into the plot beautifully. This book is not quite as good as Sears’ first book, Black Fridays. Is Sears an American author, Becky? I haven’t come across him in the UK. If so, do you think he would travel? 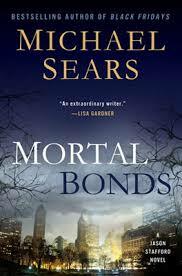 Yes, Sears is a US author and I think he’d travel quite well. Autism and financial shenanigans are not unique to Americans. Sears is good.